An authentic 500 year old stone and beamed house situated in Ferreirola , La Taha in the High Alpujarra Mountains; with roof terrace and balcony providing spectacular views all around. The tiny whitewashed hamlet is tucked away from the world, near Pitres in the Sierra Nevada Natural Park and ideal for walkers and those looking for a peaceful and beautiful environment. There are bars and restaurants within walking distance and a larger village (Pitres, bank, market etc))4km away. It is about 2.5 hours from Malaga airport and around 1. 25 hour to Granada. Property licensed by Junta de Andalucia Consejeria de Turismo y Deporte. Hi Most people ask how long I have been here. The answer is 21 years - and I only came here for a month originally, so beware this place is addictive; I have clients who have just made their 19th visit. Ferreirola is a tiny village in the mountains about an hour 15 minutes from Granada but actually a world away.Visitors have compared the area to Nepal or the Atlas mountains but, to me, it is an unique haven from the world, - beautiful, safe, with clear air and light and populated by real people. Come here if you love walking, mountains, or just lazing in the sun and reading. We have a great collection of books. Mostly you will find that you just sit and stare at the scenery in amazement and listen to the silence - possible from the terrace of one of the bars in the nearby villages! I fell in love with the place. It is remote but you can even get here by bus from Granada if you are patient. Peace, stunning views, great walking. A feeling of having stepped off the busy world. All sheets, duvet covers etc profesionally laundered and ironed between visits. Wood for first night provided free. Can be bought locally in small quantities. Or a dumper for long stays. The long, beamed living room has a wood burning stove and comfortable seating with a dining area next to the balcony. We have a large collection of modern novels in English (and welcome more). Salt, pepper, oil, some spices. Sugar, tea. Everything you would expect to find. There are 3 areas to chose from :Inside, on the balcony off the living room or on the roof terrace. Table and chairs, outside light, sun in the morning then shady during the afternoon, sheltered.private. Lots of plants, mountain views. Amazing views of the mountains. Sun all day. Great at night for star gazing. Table and chairs. Notes on accommodation: The property has a balcony and roof terrace, free Wifi, a spacious book-filled living room, double bedroom leading to a 2nd twin bedroom, a rustic but well equipped kitchen and a bathroom with shower, wc and sink and plentiful hot water. All accommodation is on the 1st floor. The house and the entire area would prove very difficult for anyone with mobility problems. The owner lives next door and is happy to help with knowledge of the area. Otherwise unobtrusive! New we now offer free wifi to visitors Sorry, no cats, I am allergic. Dogs OK. Outside: From the living room there is a south-facing covered balcony with seating and on the roof a sunny terrace for sunbathing or stargazing. From here the views of the mountains and sky are beautiful and at certain times of the year you can see eagles overhead. There is a table, lounging chairs and barbecue. Several of the local signposted walks along ancient mule trails start just outside the house, which is on the edge of the village. Cleaning / Towels / Linen / Maid service: Linen and towels included. Bring your own beach towels please. The house is cleaned thoroughly between clients. We can also provide a pack of basic provisions and/or a cooked meal. Other: Everyone's favourite place seems to be the sheltered balcony off the living room. There is a table and chairs for eating and an outside light with lots of plants and great views. There really is nothing missing in this lovely house. It's a wonderful spot from which to explore the Alpujarras with a walk across the valley starting just outside the front door, and so many other beautiful villages within walking distance. We were so pleased to be free from the more intensive tourism in the bigger towns and couldn't have wanted anything more. This is a lovely place to enjoy the Alpujaras and all the time have to offer. The traditional house with its superb views of the mountain opposite is a great space. We will be back. That’s what we like to hear! Thank you. It's true- you can leave your car in the square when you arrive and start following paths immediately, no cars just great mountains. Beautiful home in a very peaceful village. apart from in August you can almost always park in the square, 3 minutes walk away and a car is useful as the nearest shops are around 4km away. luckily there are bars and places to eat within 15 minutes walk! We will never forget this holiday. A totally new experience which we loved. Thank you. That´s what we want to hear! We loved it. Homely and spacious (well for the two of us anyway) with it's own roof terrace adjoining the owner's (but separated by a high wall) , and a lovely covered terrace adjoining the living room, cooler in the day. The house is in the lovely 'white' village of Fereirolla, with great views from both terraces over the surrounding countryside which has wonderful walks, one beginning quite literally from right outside the front door. It was so peaceful, more than we would have expected in a village location. We were able to walk to an excellent French vegetarian restaurant, and a more cheap and cheerful pizzeria ( both around 15 minutes) for dinner in the evenings, and it's a short car ride to Pitres which has a very good supermarket and bakery. Barbara is a very nice host and couldn't have been more helpful. What can I say...we loved it! Perfect guests! There are two other eating places as well within walking distance and the hotel lets non guests swim in their glorious outside pool for a modest 5 euros. Mountain biking, horse riding ,swimming pool, massage and guided walks in the Sierras all available locally. Less than an hour´s drive to the beaches of the 'Costa Tropical'. 2.5hours from Malaga airport.1.25 hours to Granada Airport A car is very useful here, although it is possible to reach the village by public transport. The last bus leaves Granada at 16.30pm. There are 3 a day. 1 hour away. The owner can recommend a pretty and quiet hotel by the cathedral . 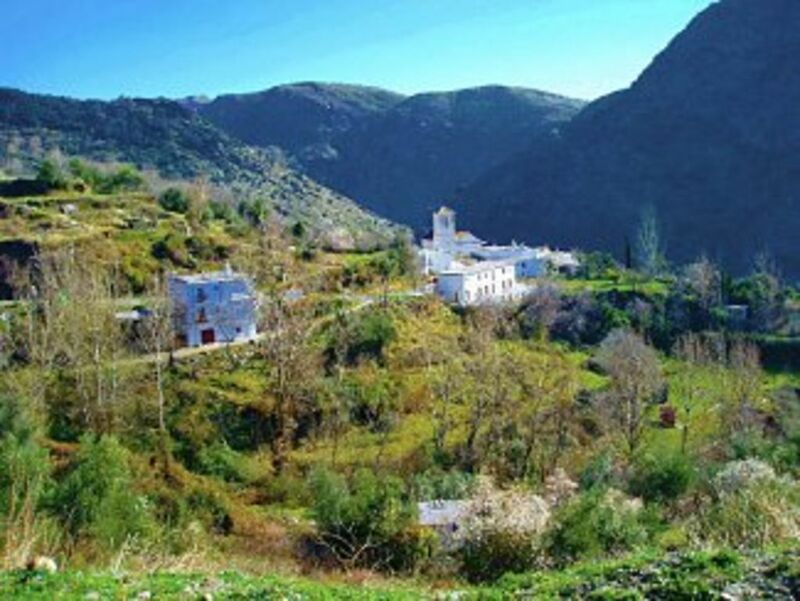 The famous whitewashed villages of the High Alpujarras are all around us and the coast at Salobreña just an hour away. 7 small villages dating back from the times when the Alpujarras were occupied by the Moors whose architecture and terrace hillsides are very much still part of the landscape. The villages are whitewashed and have steep, winding streets where it is still common to see donkeys and shepherds with their flocks passing through. The area is famous for its mineral water springs, air-dried hams and inexpensive rugs and pottery. 4 restaurants and bars within walking distance and a larger village (Pitres) just 4km away. Ferreirola has a daily bread van between 1.00pm and 2.00pm, a fruit van on Thursday mornings and a fish van on Tuesday mornings. It is only 1km to Mecina which has a family run bar and restaurant, a vegetarian restaurant, a music bar and a hotel with pool. There are many varied and inexpensive restaurants in nearby villages and the bars still give complimentary tapas with wine and beer. Pitres, 4km away has a bank, chemist, baker, supermarket,restaurant, bars and a 24-hour health centre. There is an outdoor swimming pool at the campsite. Serious walkers can scale the Mulhacen (3,482m) or Veleta at 3,398m. Guided service available. There are also local facilities for mountain biking, horse-riding, and flamenco dance and guitar lessons. Booking Notes: Changeover Day:. Any day check in after 5pm. .check out by 11.30 if other clients are coming in the same day. Notes on prices: Prices are for the property per week is 245 pounds for 2 persons. An extra 10 pounds per night is charged for each extra person. Heating: the rental price includes electricity, hot water and gas for the cooker. In winter we supply firewood for the first night free of charge and further wood can be bought at the petrol station you pass on the way up just after the village of Pampaneira. Ask for Leña (lenya). For long stays we can arrange a half dumper of wood to be delivered for 70 euros. Smoking; only outside please.